Summer reflections! What a lovely garden scene. I adore out door mirrors, and you’ve caught these perfectly. As always Carin, your story behind the photo is as charming as the photo itself. 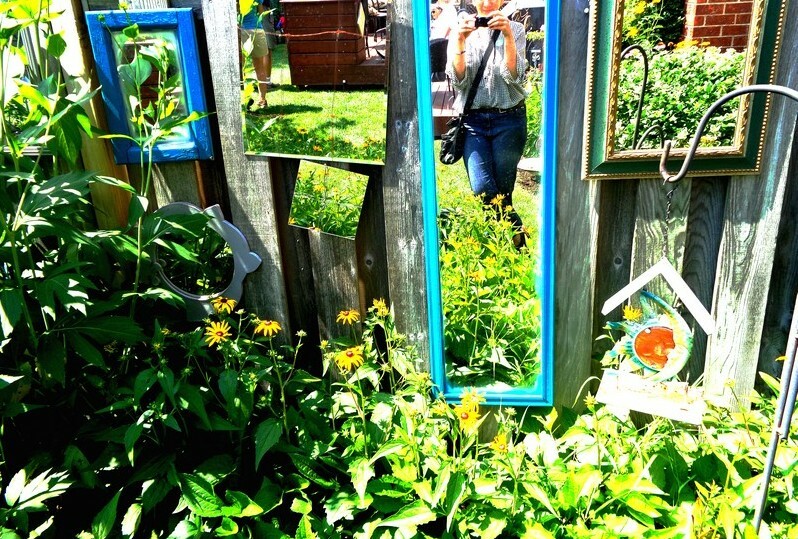 I love seeing the mirrors as I have hung a couple of mirrors here and there on the fence and people always say, “why do you have mirrors in the garden?” Sometimes they’re startled because they catch a glimpse of movement (themselves), and sometimes they think it’s “freaky” and sometimes they laugh, and they are almost always puzzled. I love the way they reflect the garden back to you – double pleasure! I love the way you describe catching a glimpse of movement in a garden mirror. Excellent point. I always think of them reflecting the yard but, really, the surprise of seeing oneself travelling through it is the real prize. In fact it’s the wee surprises in a garden I love best. Coming around a corner and seeing ‘something’ unusual or seemingly out of place, a teapot, anything. Love it Carin when there’s a bit of you inside your intriguing images. Hope you get the opportunity to tell the woman with the day lily garden, that they are an edible perennial, originally imported as a vegetable. The yellow ones are particularly delicious. Harvested as the bud develops to about-to-open stage. I slice them into salads or just pick off the plant and munch. Sweet, light celeriac flavour. Apparently they are wonderful in a saute too. Ooooh. That’s new to me. I won’t see that woman again and, to be honest, I doubt she’d want to eat her babies (I’m sure she thinks of them as something similar, VERY nurturing of them). But I’m thrilled to have this info. I only have a precious few yellow so wouldn’t want to feast on them, but it’s a good reason to plant more! Thank you! Dried daylily buds are popular in China as an ingredient for certain dishes. They are delicious, slightly sweet and tangy. I LOVE this photo, for all the reasons noted above and also because those particular shades of blue and green are so wonderful together and so very summery. And have you actually sent it to anybody as a postcard? Because it would be a fabulous one.